Gates Lodge is a classic American fly fishing destination, enjoyed by generations of anglers. It keeps getting better and better without losing it’s simple charm. A fly fishing lodge run by friendly and knowledgeable fly fishermen. 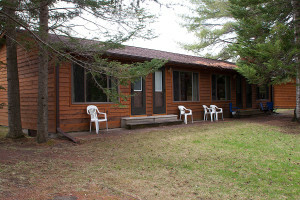 Our lodge has been family owned and operated since 1970. All our comfortable rooms overlook one of the most prolific stretches of the Au Sable River – great fly-fishing is right out your back door. All rooms offer wireless Internet, flat screen televisions, and DIRECTV. Many of our guests return year after year, some since the very beginning years of the lodge. We’re just large enough to accommodate every need, yet small enough that we get to know most of our guests by name. Come experience a truly relaxing and comfortable stay at the very heart of Michigan’s fly-fishing nirvana. 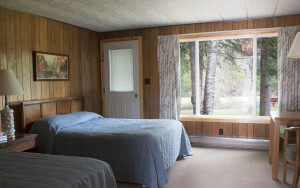 We have sixteen motel-style rooms with double beds. 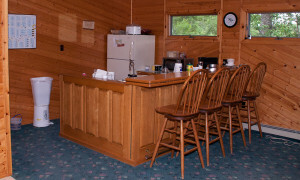 All rooms have full baths, vanity area, tying tables, cable TV, and are just steps from the river. The Brown Trout Suite has two bedrooms, each with two single beds, a stone fireplace and central living area, which makes it ideal for three to four anglers. We are pet-friendly. In addition to year-round fishing and seasonal hunting opportunities, our area is home to many family oriented activities and events! Not far from our lodge you can find nearly endless hiking, biking, and ORV trails. Golfers would have a difficult time running out of holes to play near here as well. The local newspaper maintains an extensive community calendar that you can check out as well. Don’t hesitate to ask us about activities and places to visit for your family. We can also direct you to other areas in Northern Michigan such as Traverse City, which is less than two hours away from our lodge. Mackinac Island is also much closer than you might think, so a day trip to “the island” is very feasible. Those options alone open up a whole world of possibilities for you and your family. 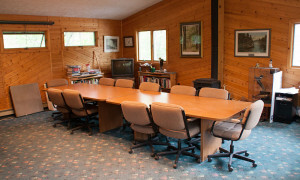 Built by Rusty Gates for Anglers of the Au Sable board meetings, the Board Room allows groups to hold conferences and work meetings. The room is WI-FI hot, and there is a computer for guests to use. It is also available for guests to gather and socialize, tie flies, and discuss the day’s fishing activity. The Board Room is available for rent for meetings and conferences for $100/day. It is still the central office of the Anglers of the Au Sable. Please fill out the form below, or call us at 989-348-8462 for immediate assistance. Please be aware that our rooms tend to fill up well in advance, especially during peak May to July dry fly seasons. What night(s) are you inquiring about? Would you like a standard room or the brown trout suite?